Today Ali Sheehey and I did some urban birding in the Los Angeles area. We missed a few target birds but I did see, new for the year, #577–Allen’s Hummingbird, and #578–Nutmeg Mannikin. If California’s checklist committee more readily accepted species that were fully established, I’d also have added Mandarin Duck, Orange Bishop, and Red-whiskered Bulbul. If only keeping exotic birds off the list kept them out of the natural world as well. This entry was posted in Uncategorized on December 14, 2013 by Laura Erickson. Ever since January 1, I’ve been working on seeing as many birds of conservation interest as I could in 2013, which I’m calling my Conservation Big Year. At some point, I set some sort of goal in my head of seeing at least 600 species this year. Now it’s December 12, and my list is at 575. Twenty-five species remaining is a lot at this point in the year (I had to take a sizeable break to finish a book project that was overdue), but I’ll definitely at least be closing some of the gap, because tomorrow I’m headed to southern California for 10 days. One of my birding friends, Ali Sheehey, will be taking me around on the weekend, and is putting together a loose itinerary for the rest of my visit to help me maximize my chances of getting to 600. She plans to help me see two of the top birds on my most wanted list less than a half hour from the airport when I arrive–the endangered California Gnatcatcher and the White-headed Woodpecker. I’ve seen both species in earlier years, but have no photos of either. When I took Cornell’s field recording workshop in 2001, we stayed at a field station in the Sierra Nevadas where the woodpeckers were nesting. It was spectacular to spend so much time with what had been my personal nemesis bird, but I’ve not seen them since, so I’m hoping against hope that Ali and I get that one! I was already in central California in September, but missed several migrants at that time, such as Red-breasted Sapsucker, which should be fairly easy because it visits feeders in winter. My most wanted bird of all is one of the trickier ones, though a few winter down there—the Hermit Warbler. 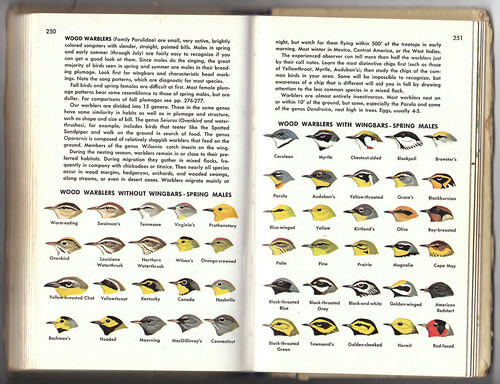 This year, I’ve managed to see every single warbler species in my trusty old Golden Guide except the Hermit. 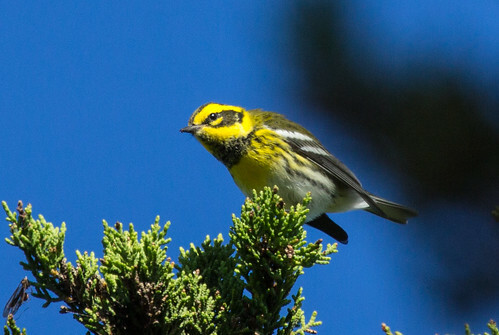 When I started birding, the Golden Guide’s lovely 2-page spread showing all the warbler faces became like my own personal wish book, and now in just one year I’ve seen all but one—that is the one gap I most wish to close. 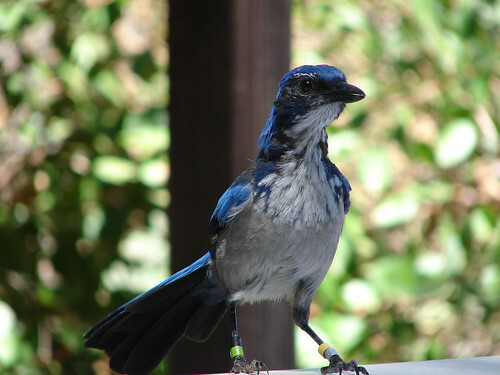 I’m also going to take a boat out to Santa Cruz Island to see another most-wanted species, the Island Scrub-Jay. 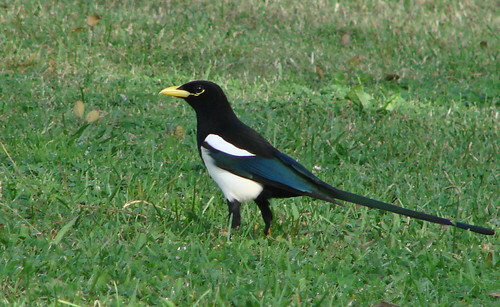 I got to see this species once before, in August 2005, on a post-convention field trip after an American Ornithologists’ Union meeting. That month turned out to be my personal scrub-jay sweeps month. Russ and I visited our son Joe in Florida early in the month, and we took time to see Florida Scrub-Jays in Lake Kissimmee State Park, and then I got to see the Island Scrub-Jay later that same month. Both of those species are exceptionally rare species, yet I got to spend quality time with both. 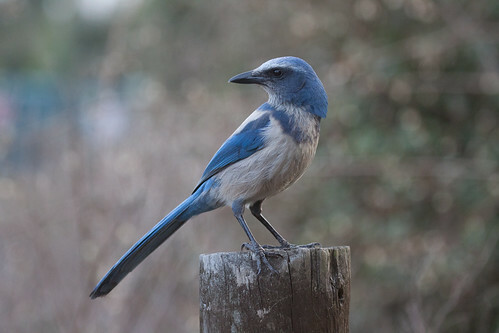 The hard scrub-jay for me to find that time was the far more common and widespread Western Scrub-Jay, which turns out to be tricky to find on the University of California Santa Barbara campus—I finally saw a pair on my last day there. 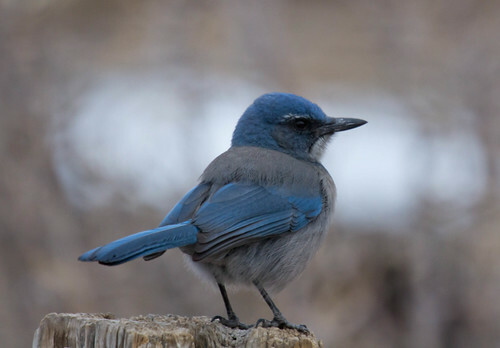 This year I’ve seen Western Scrub-Jays on many occasions. I got my Florida Scrub-Jays back in January. There are a bunch of rarities that I’m also hoping to see, and I should also get photos of a few species I’ve seen this year but not photographed yet. Whether or not I make it to 600 remains to be seen, but whatever happens, I’m having the funnest birding year of my life and this trip promises more of the same. This entry was posted in Uncategorized on December 12, 2013 by Laura Erickson.